Tennessee point guard Jordan Bowden takes the ball up the court during the top-ranked Vols' 73-61 home win against Florida on Saturday. The Vols have won 18 straight games. 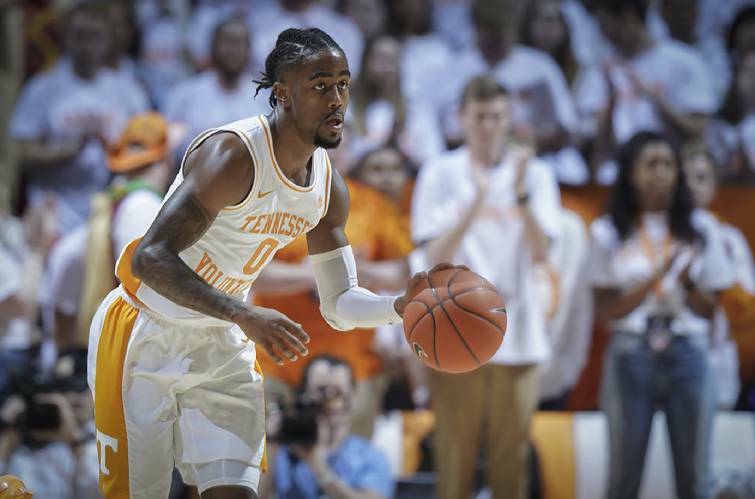 KNOXVILLE — The top-ranked Tennessee men's basketball team won its 18th consecutive game Saturday, defeating Florida 73-61 in front of a sellout crowd of 22,261 at Thompson-Boling Arena. The Volunteers (22-1, 10-0 Southeastern Conference) started slow but used a 17-3 first-half run to assume control of the game. They led 36-30 at halftime, took an early second-half shot from Florida (12-11, 4-6), then put together a 12-2 run to pull away. Grant Williams led the Vols with 16 points and tied with Admiral Schofield for the team high in rebounds with six. Schofield, who scored 14 points, had back-to-back dunks during a run late in the second half. Jordan Bowden shot 4-for-6 from the field in a 13-point performance, Jordan Bone added 10 points and five assists, and all nine of Lamonte Turner's points came on second-half 3s, including two consecutive as part of the Vols' run in response to the Gators cutting the lead to 40-36. Tennessee's Kyle Alexander battled foul trouble but had six points and blocked a pair of shots. Noah Locke led Florida with 17 points, Jalen Hudson had 15 and KeVaughn Allen 11. The Vols host South Carolina at 6:30 p.m. Wednesday in the finale of a three-game homestand..
Tennessee's defense — a weak spot at times this season — was overall really good against the 3-point-happy Gators, who spent most of the game hunting long-range shots. The Gators were held to 36 percent shooting from the field and 31 percent from 3-point range, reaching their average of 8.9 made 3s per game but shooting below their average success rate of 35 percent. The Vols' offense, which stagnated at times, was surgical when it needed to be, making 53 percent from the field. Maybe it's nitpicking — once you're No. 1 in the country, that's what people do anyway — but Florida finished with 15 offensive rebounds, largely due to missed 3-point attempts it was able to corral. The Vols also had some stretches where they were careless with the ball, including three consecutive second-half turnovers that led to a 7-0 run by Florida. In a game in which Tennessee's offense stagnated at times, the Vols shot 59 percent in the second half and still topped 70 points for the 20th consecutive game. The defense did its part in shutting down the Gators' offense. It was an inconsistent performance, but one that was again led by the defense in a season that's largely been controlled by the offensive results. Check back later for more Vols basketball coverage and see Sunday's Times Free Press.